B&T Honey Co. was developed by the Berry Beary Honey Co. a family-owned, Alberta, Canada based, premium honey company, in partnership with Avi Markus, owner of QOL Programs and the co-founder of nourishtea, a certified organic loose leaf tea. 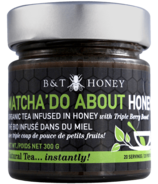 B&T Honey is an incredibly unique way to enjoy a rich, and healthy cup of tea. Their honey is gluten free, fat free, and made from only natural Canadian honey & blueberries and ethically sourced teas from around the world. They are also proud to support the Canadian Food Bank system through product donation.